Making another version of the Meribel Boarding Hat is pretty easy. This one’s smaller – same stitch count but on 4mm needles instead of 4.5mm, and a ribbed brim of 3″ instead of 5″. It will fit a head from approx 21 – 22″, so an average women’s or youth size. To get a smaller one, cast on fewer stitches. The new charts are over 32 stitches (32 squares on the graph paper). They’re repeated 3x around the hat. If you want to cast on fewer stitches, take out some of the spaces between the trees and deers. 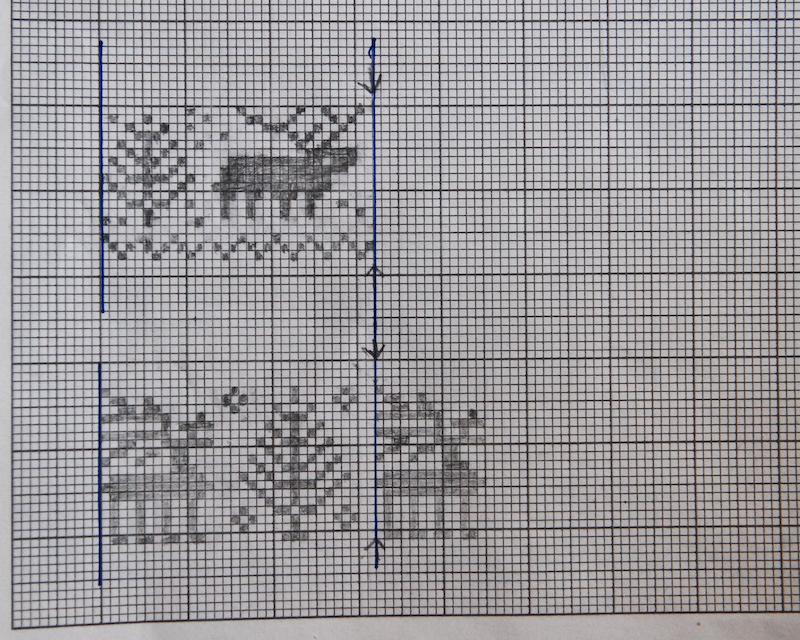 The auld deer chart could easily be reduced by one stitch either side of the deer. Taking out 2 will make a 30 stitch repeat, so cast on 90 stitches. The young deer chart can be reduced even more, if required. You can take out 2 stitches from either side of the tree, making a repeat of 28 stitches, 84 stitches to cast on. You’d need to move or remove an odd snowflake, but do go ahead as you see fit! The charts are written here are all 32 stitches to be used three times for a 96 stitch cast on. Please go ahead and adapt as you see fit, but do let us know. We are asking to publish your own pictures of finished hats on the Ravelry Pattern Page for the Meribel Boarding Hat – there’s a lovely gallery building there. Go and see for further inspiration. For the complete pattern, go here. And enjoy! This entry was posted in Free patterns, Knitting and tagged chart, fairisle, Meribel Boarding Hat, tree. Bookmark the permalink.